This is the characteristic species of the heather-clad moorland of the Peak District: there can be days in the hills when the only birds to be found are Red Grouse and Meadow Pipits. This seems fitting, because the unique landscape of large parts of upland Britain arises from management to arrest the vegetational succession, solely to benefit grouse. During this survey, Red Grouse were recorded in 11 tetrads in the breeding season, as in 1978-84, three gains being balanced by three losses. The loss of birds from three tetrads on the edge of their distribution suggests that their range has contracted somewhat. However, a gain comes from a major heather regeneration scheme on High Moor and Piggford Moor (SJ96U): this started in 1990 and by 2001 was suitable for the introduction of some Red Grouse (May 2004, 2005a, 2005b). The population is self-sustaining and the hard work has been rewarded with increasing April counts of 13 pairs (2004), 25 pairs (2005) and 35 pairs (2006). Because of their importance for the economy of British uplands, this species has received probably more scientific study than any other, mainly by the Game and Wildlife Conservation Trust. However, Red Grouse are now on the Amber List of species of conservation concern because of their long-term national population decline. The causes are said to be poorer moor management through fewer keepers, overgrazing, increasing incidence of disease, increased predation and loss of habitat. Not mentioned in this list, but surely likely to become more significant, is climate change: Red Grouse, the British race of the cosmopolitan Willow Grouse, is a northerly species here at the southern limit of its range and the present warming trend is likely to affect them adversely. Red Grouse are herbivores, feeding almost exclusively on heather (ling) Calluna vulgaris, especially the new growth from plants 2-4 years old. They do also eat, according to availability, other moorland plants including bilberry, cranberry and cotton-grass. The autumn fruits are favoured, but at any time of year grouse eat the leaves, stalks and flowers. To grind up these hard fibrous materials in their gizzards they need to ingest small sharp pieces of stone, of which there is no shortage in the millstone grit hills of the Dark Peak. Like other gamebirds, chicks need invertebrate food, especially during their first ten days of life, and females often lead their chicks to areas such as bog flushes that are rich in insects like flies, beetles and sawfly larvae. A thorough survey of all suitable land in Cheshire led to a population estimate for 2002 of 273 pairs, an average of about 7 pairs/ km2: this is quite a high figure (Oxenham 2002). The natural density of Red Grouse is thought to be 4-5 birds/ km2, but this is uneconomic; figures of 10-15 breeding pairs/ km2 are needed to sustain driven shooting and pay for the necessary investment in effective control of predation, disease limitation and heather management. Following the rise in population on High Moor and Piggford Moor, the Cheshire total in 2006 might be 300 pairs. Grouse numbers are naturally cyclical, peaking roughly every four or five years, mostly because of periodic disease from Strongylosis, caused by a parasitic nematode worm; high levels of infection can reduce grouse breeding success, and also cause direct mortality, with badly infected birds less able to escape mammalian predators. During this Atlas survey period, monitoring of grouse moors in northern England showed 2004 to be a peak year, followed by a population crash. 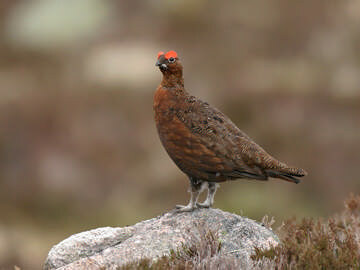 The high grouse numbers in autumn 2004, together with wet and mild weather, allowed large increases in parasite burdens, and half of all adults died during the 2005 breeding season, compared to 14% in 2004. Combined with lower breeding success (an average of 1.56 young grouse per surviving adult compared with 2.38), the number of Red Grouse at the end of the 2005 breeding season was just 40% of the figure twelve months before.